Crème Brûlée by 101CAFFE’: the winning delicious caramel cream! 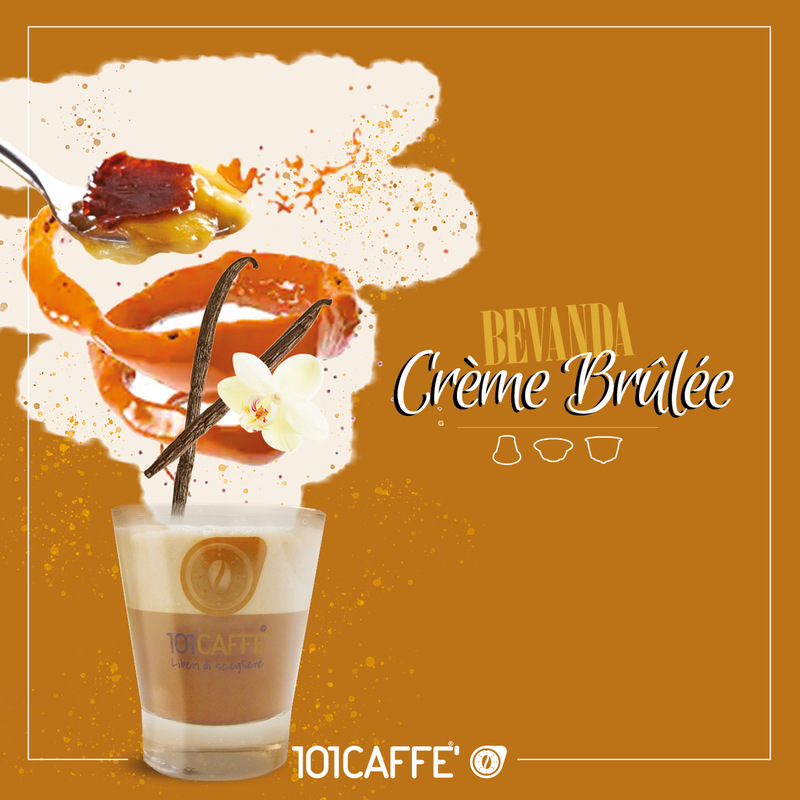 Crème Brûlée by 101CAFFE’ is a delicious hot drink for gluttony moments; it doesn’t contain any coffee, sweet and delicate just like the dessert from which its name comes from; to be enjoyed either at office during the break or at home with your special guests. The crème brûlée is popular also in Italy, made with cooked English cream and an irresistible crispy pastry with caramelized sugar. Despite its name, the crème brûlée comes from an ancient English recipe of the late 16th century: since 1879, at the Trinity College in Cambridge, there is a tradition to prepare this cream by imprinting the school emblem on it, with a red-hot iron. 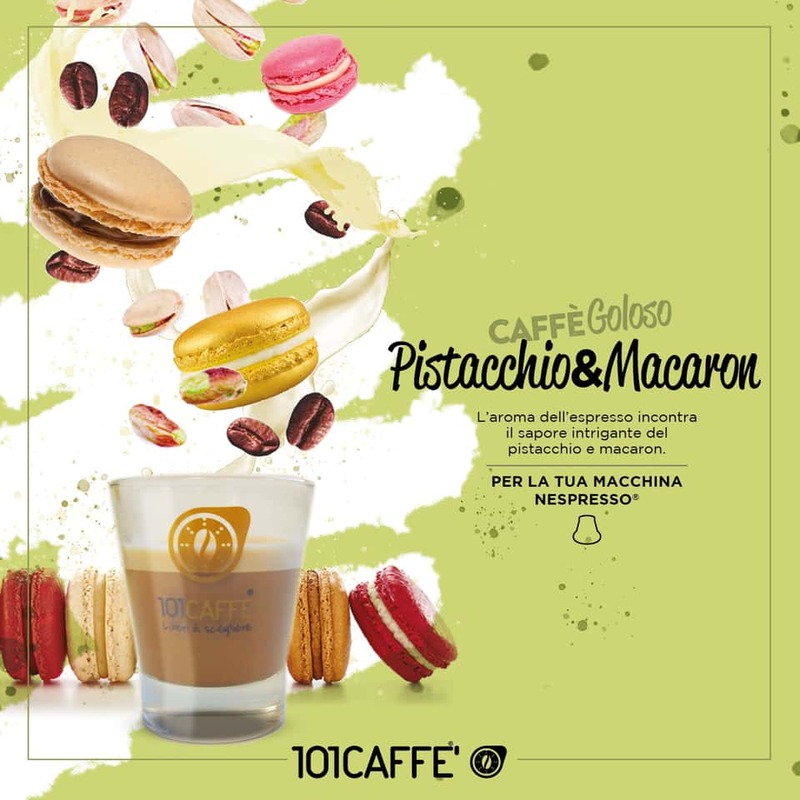 101CAFFE’ has mixed its sweet flavor cream with caramelized sugar, for a really tasty time. Greedy people won't resist this amazing hot drink, with notes of caramel and without caffeine, therefore good for everyone. Just a few seconds to prepare this hot flavored drink, that you can easily prepare with your coffee maker. Ginseng is the root of a plant called Panax, whose name in ancient Greek means "remedy for all" and “panacea” in Italian. The word ginseng also comes from Chinese and means "human plant" because of its shape, very similar to the human body, with its arms and legs. Ginseng species are about eleven and the most precious ones come from Asia (China and Korea). Ginseng has a rather bitter taste and often is associated with other ingredients to facilitate its consumption. Ginseng is very common as coffee, thanks to its particular aroma and creamy consistency, often drunk as an alternative to coffee at any time of the day. Benefits of ginseng coffee are known and proven by science, so that more and more people are usually choosing it to improve their memory efficiency, their energy, to reduce physical and mental fatigue and so on. 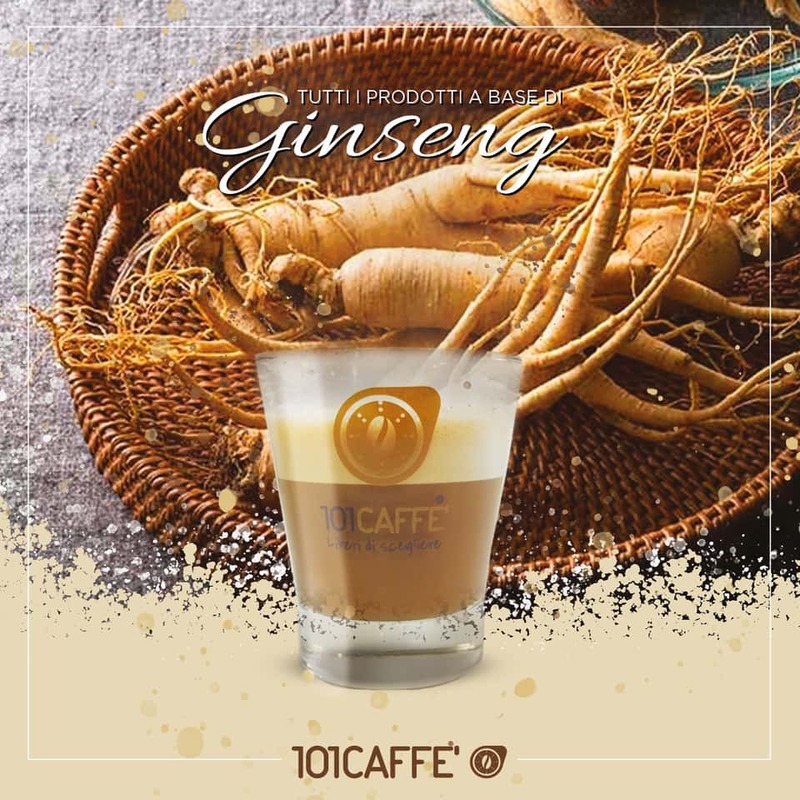 The whole 101CAFFE’ Ginseng range is completely made in Italy and is really amazing and unique with its coffee and drinks: Caffè Ginseng, Caffè Gran Ginseng, to be drunk out of a large cup, Caffè Ginseng Amaro, highly appreciated by those who love the energizing flavour of ginseng, Caffè Ginseng Leggero (light) , to recharge your energy, all available in pods and capsules for the most common coffee makers like Nespresso®, Nescafe® Dolce Gusto®, Lavazza A Modo Mio®, Lavazza Espresso Point® and ground coffee for Italian Moka. Ginseng is not only limited to coffee, but it is also used for herbal teas, like Tisana Grintosa with green tea, mate, guarana and obviously ginseng, ideal at any time of the day, to enjoy hot or cold and available in capsules for Nespresso® coffee makers and for delicious coffee, such as Caffè Ginseng&Matcha with matcha tea, vitamins, mineral salts and its antioxidants and Caffè della Bellezza, elixir of beauty and vitality with collagen and the energizing properties of coffee, together with ginseng extract, available in capsules for Nescafé® Dolce Gusto® coffee makers. Among the wide range of 101CAFFE', Tazzulella is the classic high-quality Italian espresso, with soft and full-bodied flavour, symbol of tradition and exquisite craftmanship. Tazzulella is a coffee blend of 50% Arabica from Central America and 50% of Indian Robusta coffee selections, roasted according to a Neapolitan recipe handed down for three generations. Its honey-coloured cream and toasty notes recall the traditional taste of good home-made espresso. 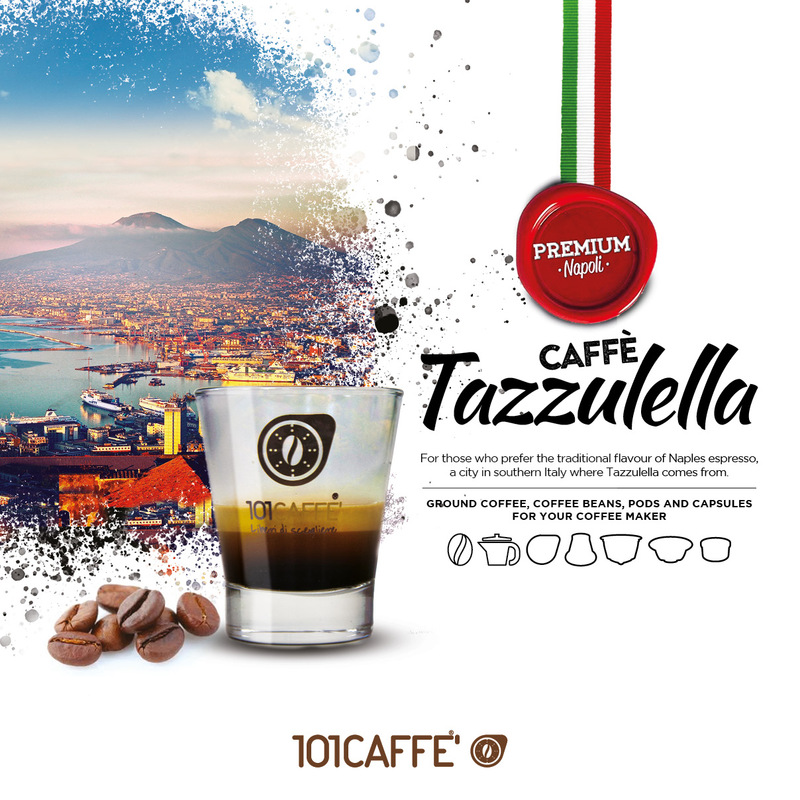 Thanks to its balanced and harmonious aroma, Tazzulella becomes the favourite coffee blend for those who prefer the traditional flavour of Naples espresso, a city in southern Italy where Tazzulella comes from. There are many rituals and stories around "na tazzulella 'e cafè", the famous Neapolitan ritornello from a traditional Italian song: the true coffee culture to be consumed daily. Available in pods, capsules, ground and beans for every coffee makers, it is sold in all 101CAFFE’ stores and on our ecommerce. Thanks to 101CAFFE’ Topping you can make tasty and easy recipes with natural and simple ingredients. creams to prepare special cups of coffee and tasty desserts and enrich your daily coffee ritual: soft cakes, donuts, muffins, panna cotta and even to garnish fresh and seasonal fruit.